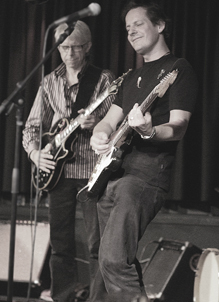 Picture from Blues jam hosted by Kenn Lending. Oktober 2006, at Jazzhus Dexter, Odense. "His music touched me deeply, and I quickly started frequenting the blues venue rådhuskroen (which is now Mojo, ed.). I got to know Kenn Lending. He tutored me, and one night during a jam session when he was playing amid the audience, he suddenly gave me his guitar. I played like a madman, and afterwards Kenn Lending told me: ‘you can play whatever you want, but don’t forget to play a little blues. It’s in your blood.’ I took that piece of advice, and I have played nothing but the blues ever since." From inteview by Uffe Christensen, Jyllands Posten.